Do you love tea, coffee or soup? Are you tired of dreg and cleaning when you drinking. If yes , then our paper tea bag must good helper for you! Our tea bags are perfect for loose tea, spice, plants, coffee or herbal powder. 100% natural, unbleached & biodegradable, designed as purely as possible so that the taste of tea is not affected by the bags. and also the paper thin enough to allow the tea to seep through easily, steeps a flavor full and enjoyable brew! Easy to fill and no need cleaning up, disposable use. Processed by UV sterilization,non toxic,chlorine free, biodegradable. Drawstring design, safe and leakproof, strong and resistant to brew. Great used for tea, coffee, herbs, hot pot, soup package,bamboo charcoal bag and more. NATURAL AND SAFE: 300pcs Natural wood pulp filter paper, unbleached,non toxic, processed by UV sterilization and infrared drying. They are fully biodegradable and environmental friendly keeping a green planet . PERFECT DESIGN: Easy to fill, there is a drawstring to prevent any loose leaf from escaping，no fuss, no mess. Enjoy loose tea anywhere and anytime, make loose tea fast and easy with virtually no clean up. HIGH QUALITY: The filter paper features strong penetration and high temperature resistant, let the tea seep through easily and quickly to get more strong tea, while it can be put boiled water without damage or release harmful materials. WIDELY USED: Apart from tea, it can also be used for coffee, herbs, scented tea, foot bath, soup, bamboo charcoal bag etc. Just relax and enjoy your leisure time. Meanwhile it is regarded as a perfect gift idea for those who loves tea or coffee. 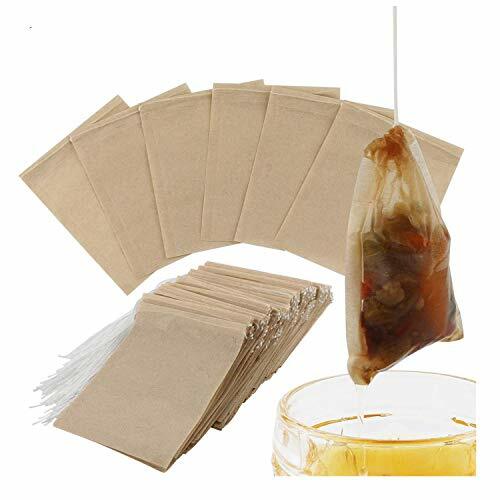 SATISFACTION GUARANTEE: We strive to provide you with best quality product and customer experience possible; our tea filter bags is guaranteed;100% money back lifetime guarantee,so enjoy your risk-free purchase. If you have any questions about this product by WINIT, contact us by completing and submitting the form below. If you are looking for a specif part number, please include it with your message.